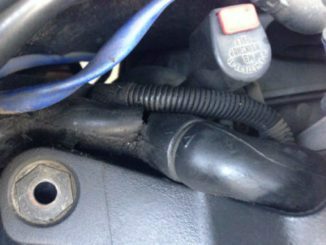 Learning how to install a cylinder sleeve is an excellent way to salvage an otherwise junk block. 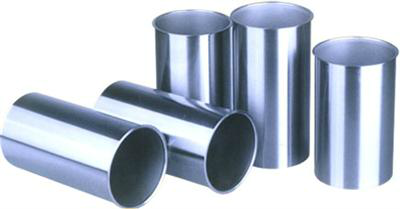 Cylinder sleeve come in all different diameters as well as 3/32 and 1/8 thickness depending on what type of repair you are doing. Also a great choice for saving a block already worn past .060 that you can make back to a standard bore. Some engine blocks are just too hard to find. Measure the sleeve top-middle-bottom, rotate the sleeve 90 degrees, and measure again top-middle-bottom. Therefore the average measurement is the size of the cylinder sleeve. 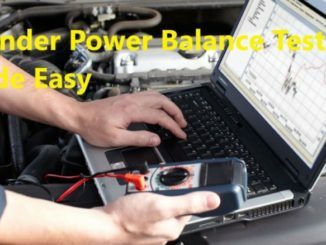 Use this measurement to calculate interference fit. Some minor sleeve distortion may have occurred during shipment. 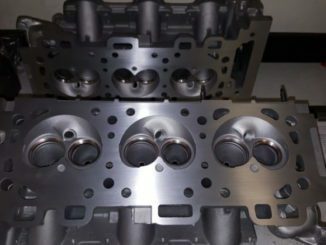 The sleeve will conform to shape after it is pressed into the cylinder bore. A little trick to aid in pressing in a sleeve is to refrigerate or freeze the sleeve to shrink it slightly. So stick the sleeve into the freezer AFTER you measure it. It is time to determine how much press is needed for the application. Usually .003 for most applications. Please keep in mind that the machinist’s past experiences should also be considered. There are numerous factors that will affect the amount of press required hold the sleeve in place. Consequently you boring the other cylinders as well. (Remember, the more press – the greater the distortion to the surrounding cylinders. This distortion may not become round with just finish honing. Stop the boring tool 1/8″ to 1/2″ (depending on type of block, piston travel, oil ring location, length of crack, etc.) from the bottom of the cylinder to leave a step (ledge) for the sleeve to sit on. As a result the cylinder head will hold the sleeve from the top. Bore the block to size to accept the sleeve. Change the boring machine cutter to a pointed tool. In order to square the step/ledge, set the tool about .010″ (per side) less than the block has been bored to. Lightly cut away some of the chamfer until the cutter reaches the flat, or the top of the step/ledge. This allows the sleeve to sit fully on the step/edge, not partially on the chamfered edges. Apply a sleeve retainer compound of your choice (optional if not repairing a cracked block) to the outside diameter of the sleeve, then either press or carefully drive the sleeve into the block. Make sure the sleeve is all the way down and bottomed out. Trim the excess sleeve material from the top of the block (with the bottom flat of the boring tool if there is substantial material). Finally bore the sleeve to required inside diameter size. 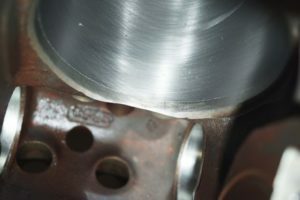 With a long sharp file, remove any sleeve protrusion that would cause head gasket problems, or deck the block with a mill. If you don’t want to mill the block you might try stoning the top deck of the block as a finishing touch. I like to use a hard griddle stone or a soft knife sharpening stone. Finally, chamfer the top inside diameter of the sleeve.